Charles Egbert Craddock, 1850-1922 (pseud. Murfree, Mary Noailles) The Prophet of the Great Smoky Mountains. Boston; New York: Houghton Mifflin Company; Cambridge: The Riverside Press, . 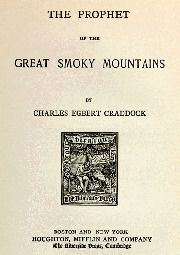 Clergy -- Great Smoky Mountains (N.C. and Tenn.) -- Fiction. Clergy -- Tennessee -- Fiction. Dialect literature, American -- Tennessee. Mountain life -- Great Smoky Mountains (N.C. and Tenn.) -- Fiction. Mountain life -- Tennessee -- Fiction.